This is part three of Mabel Suen's Chef's Choice profile of confectioner Janet Shulman of the Caramel House. Part one can be found here. Part two, a Q&A with Shulman, is published here. Janet Shulman knows sweets. Before forming the Caramel House company on her own, she started off baking all kinds of sweets under the name the Baking House. But her passion for confections began long before that. Shulman fondly recalls early childhood memories of her grandmother's caramels. "I remember unwrapping the precious cubes of caramel sent to us from Salina, Kansas, at holiday time, popping them in my mouth and mumbling 'mmmm...'" says Shulman. While she's always trying to find fresh flavor pairings for her caramels, there's perhaps none as tried and true as the combination of caramel and apples. Try out this recipe for her Caramel House Baked Caramel Apples, a perfect intro into the fall season. Core the apples; however, make sure you do not carve out the base. In a small bowl, combine butter and nutmeg. Fill each apple with 1 tablespoon of the butter-nutmeg mixture. Place the filled apples in a baking pan. Add 1/4 cup water to the bottom of the pan. Bake for 30-35 minutes or until the apples are soft enough to be cut with a spoon. Meanwhile, unwrap the Caramel House caramels choosing any one flavor and place them in a heavy saucepan. Melt over a very low heat. Remove from heat. Stir in 1/2 cup whipping cream and blend. When the apples are finished baking, remove from oven. 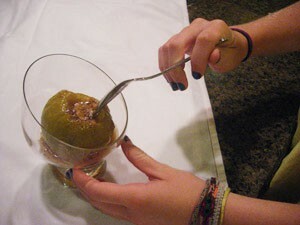 Using a large spoon, lift apples and place in dish. Spoon 1/6 of the caramel sauce over the warm apples. Must be eaten warm with a spoon!